A list of the best Lens Hoods, Screen Protectors, Cases, Straps, Thumb Grips, Soft Shutters and more. For the Fuji X100F. You can see what accessories I’m using for my X100F in the picture above, but I’ll have more soon. I’ve tried out most of these accessories so if you have any questions be sure to leave a comment. I’ve ordered the X100F in silver this time. Also check out my Fujifilm X100F Review. The batteries for the X100F now use the bigger X-T2 batteries. Cool right? So there are the new NP-W126s. The deal with these is they allow a consistent power discharge under high heat. Typically as batteries get hot from an intense discharge, they can dip in power output resulting in camera crashes. The NP-126s are supposed to prevent this. So far I don’t think we’ll have this problem with the X100F, since it’s not really the performance monster as the X-T2. I’m assuming the camera will only have three internal battery terminals like the X-Pro 2 so it would likely not even be able to take all the power the batteries are capable of outputting. We’ll see. In the meantime here are the batteries I’ve been using. It looks like the X100F still is using the UHS-I memory cards. I’ll do a full test when the camera gets in to see which memory cards perform the best. I’ll be testing the camera this Sunday, March 5. I’ll have results later in the week. The Fuji X-E2 screen protectors and the X100T screen protectors work perfectly on the X100F. Turns out I had an extra JJC Ultra Hard protector and it fit great. I usually recommend the Expert Shield because of the lifetime warranty, but the JJC hard screens are nice too. They are a little harder to deal with if you get dust on the screen. If you don’t have a thumb grip or don’t plan on getting one, then the terminal protectors are very nice to use when you’re not using an external flash. Comes with a Hot Shoe Cover, Sync Terminal Cap & Vertical Grip Cover. Only the Hot Shoe Cover works on this camera. Set up your camera with a soft release button. There are so many options out there it’s hard to decide. Here are a few popular ones but there are many options besides these. Right now I see a lot of people ordering the 10MM Diameter one probably because they are cheaper, but they do fall off occasionally because they lack a rubber spacer that keeps them from vibrating. The Lensmate has the rubber spacers but are pricey. The thumb grips are really nice to secure the camera in hand. This is one of those must have accessories in my opinion. I’ve also written a complete review with sample photos of the Lensmate X100F thumb grip. Sony actually makes some pretty nice leather cases for the X100F. You can swap the battery and memory card through an opening on the bottom. Kaza Deluxe has been my go-to leather case for my last few cameras. I have their case for my X-Pro 2 and love it. They come from Hong Kong and can sometimes take a few weeks to ship, but totally worth. In my opinion this is probably the best leather case for the X100f when you consider what you get for the price. Luigi cases are also nice but I think this is more reasonable. I’ve been using the Gariz leather cases for years and have liked them a lot. They are great for the X100F and maybe a little less bulky than the Kaza case. What’s really nice about the Gariz leather half case, is it has the metal base plate, so the camera sits nice on flat surfaces and mounts really well to a tripod. However, on my X100T, the metal plate eventually fell off after a few years. The Fujifilm X100F has what looks to be the exact same lens as previous models which means the previous lens accessories should all work just fine. These are pretty important for a fixed lens camera like this. You can’t just send your lens in for repair or replace it like you can with an interchangeable. There are quite a few lens hoods out there now for the X100 series of cameras. The official Fujifilm Lens Hood and Adapter Ring are finally a reasonable price and are a great option. They use to be over $100. You can buy just the adapter ring for less money if you’re just looking for something to mount a UV filter to. This is the UV adapter by Fujifilm. Looks great, comes in silver and black. This is for if you want to just be able to attach filters to your lens. It sticks out slightly so it will provide some sun glare protection, but not as much as with the adapter plus hood. Black & Silver Available. A great lens hood, you can also remove hood and use just the filter adapter. Like all these adapters, it takes a 49mm filter. I was using this lens hood on my X100T. Sometimes the hood itself will be slightly loose and have some play. However, my last version didn’t have this issue so maybe they improved the design. This time I ordered one of these, actually I ordered the above and they sent me this one. I like it a lot more because the lens hood folds in instead of fans out, which means you can still use your Fujifilm lens cap. Check out my LH-JX100 II review. This is a pretty cool square metal lens hood. It’s a different style and a different look. If you use your OVF you will be able to see the very corner of it but it’s not really a big deal. B+W are the best. Made by the Germans. You know who else makes good stuff? The Japanese. 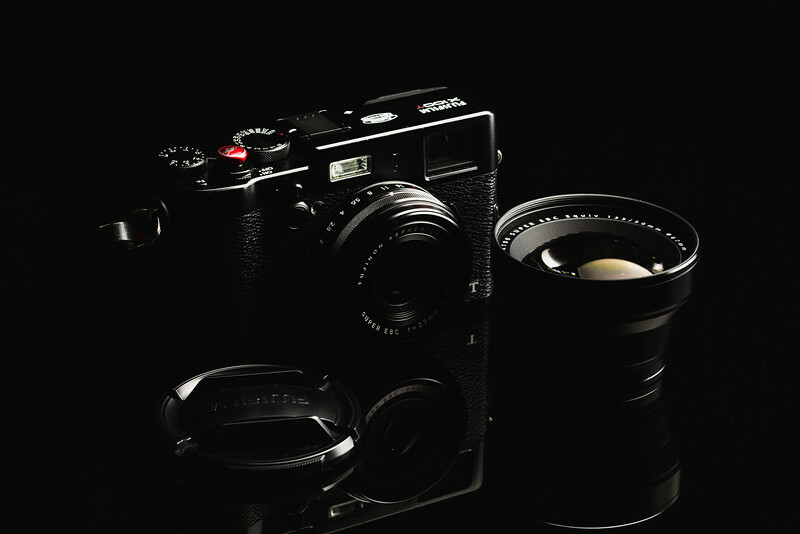 There are two new lens converters available for the X100F. They’ll also work on the previous models. The big advantage of using the new lens converters with the X100F is that they now are able to notify the camera when they are screwed on. Previously you would have to go into the menus and manually tell the camera the lens converters are mounted. This would tell the camera to correct for distortion and vignetting. If you forgot to turn this on, or off, then you’re left with a weird image that’s corrected for the wrong lens. These are very nice lens converters. It will give you the field of view of a 50mm on your X100f. It’s a little heavy and bulky and ultimately will reduce image quality every so slightly. So sharpness and micro-contrast will fall off a little bit and you may not even notice. You will also see the lens out of the OVF, which isn’t really a big deal because the image lines will automatically crop in to give you the correct 50mm view. The wide-angle conversion lens gives you a crop down to 28mm. If you’re familiar with the 18mm pancake lens for Fujifilm’s X-Mount cameras, this gives you almost the same field of view as that lens. Like the 50mm conversion lens, you’ll get a slight reduction in overall image quality compared to the built-in lens of the X100F. Both these adapters are very nice for expanding the capabilities of your X100F. It’s getting to that point where I need to make a dedicated page just for all the great straps I’ve found. I’ll likely do that next year, so if you’re on my Fuji newsletter (down below) I’ll send that out when it’s ready. Expect it to be very cool and thorough. There are several wrist straps I’ve tried now, the Gariz, the Gordy’s and now the Hard Graft Slide. I’ll give a little bit of information about each one. They’ve been discontinuing a lot of their camera straps. Get them while you can. 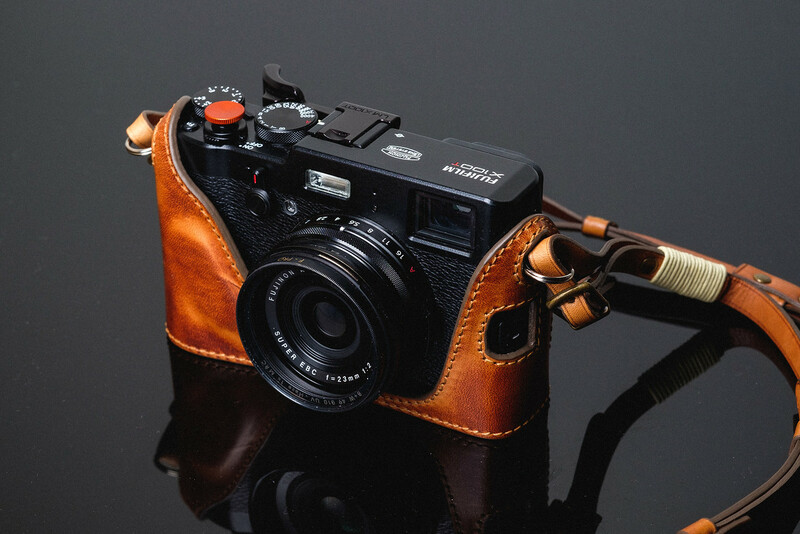 I’ve found some really nice leather straps that would go very well with the Fuji X100F. Check these out. They’re a bit expensive but it’s genuine leather and should last you a lifetime if you take care of it. I’m actually also working on my own brand of leather straps. They will be very cool. Join the newsletter if you want updates on that. HardGraft – (Instant Camera Strap) – I’ve been using the Re-Process on my XT1. It’s worth looking at. I love it. They’ve introduced several new designs that you should check out. They have discontinued some of their straps. Luigicases – Luigicases.com This is the strap I use in the first photo of this post. 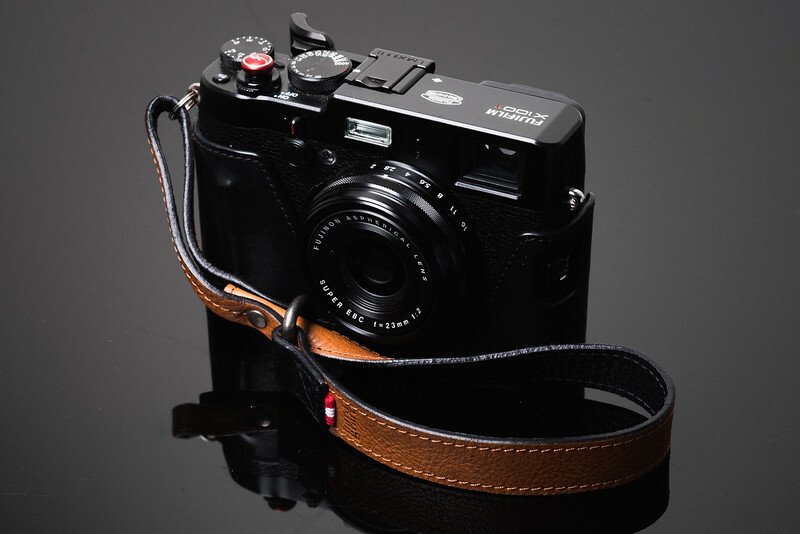 Gariz Leather Straps – (Amazon) If you just keep your original Fuji strap, something like a C-Loop is nice for being able to quickly take it on and off. I use a wrist strap for my X100F and a full strap sometimes with a C-Loop. For my X-T1 I like having a full strap all the time. My friends brother makes these C-Loop straps. They are very handy. You can also get a similar product from Black Rapid. C-Loop Camera Strap Mount – Amazon There is a new C-Loop mini that might work nice with the Fuji strap. I have the Mover 20 so I can fit both my A7r and FujiX100F in a single case at the same time. If you just have the Mover 10 you can fit a FujiX100s and X100F both at the same time. It’s tight but it works. One of the features I really like is when you unzip the case, the top flap has a built-in magnet that snaps shut to keep everything from spilling out if you forget to zip it back up. The Think Tank Mirrorless Mover 10 is a perfect snug little case for just the X100F. It fits the camera very nicely, and you can carry some extra memory cards and a usb charger. The Think Tank Mirrorless Mover 20 is a great option if you want to carry your X100F and a few of those conversion lenses. Or, throw in a few other things instead like a wallet, battery chargers, smart phone etc. I think the X100F also will fit in the Mirrorless Mover 5. I’ll have to order and check. Ona also has some great stuff here on Amazon. But I personally haven’t used their bags so I can’t say too much about them. Fuji makes a few flashes but I’ll list the two compacts since that’s sort of the purpose of this camera. The Fujifilm EF-X20 and the EF-20. The main difference is the Fujifilm EF-X20 is smaller, takes AAA batteries and does not tilt or swivel. It also has a manual control dial on the top. The EF-20 takes AA batteries and can tilt but has a slightly cheaper build quality. People using the EF-X20 complain that the batteries die quickly and the recycle time is about 5 seconds. The EF-20 is slightly better for this and you’ll be able to use it as a bounce flash which is pretty nice. I personally just use the flash built into the X100F. But if you need a little bit more power the EF-X20 isn’t a bad option. It will also take AAA batteries, so you don’t have to worry about it draining the battery in your camera but it has a fairly slow recycle time. Something you can easily fit in your bag. It syncs straight to your camera without a hassle and can print instant film on the fly. Cool for parties or something where you want to leave behind some retro prints. There are really only a few cleaning items you need for this camera since it’s a fixed lens. To clean the lens I always use Microfiber cleaning cloths. I don’t use lens pens or any cleaning solution. They always seem to leave a strange residue and you don’t want to ruin the coatings on your lens. I go through Microfiber cleaning cloths like their socks. Buying them in bulk is the way to go and this pack is actually really nice. I always keep a Rocket Air around to blast out any dust from those small hard to reach edges. Q-tips can be nice. I’m sure you have some in your bathroom so I’m not going to list Q-Tips on a camera accessory page. I usually use these little rocket airs to clean my sensors and lenses. Since you’ll never see the sensor on your X100F, it becomes a nice little tool for cleaning your lens. They make a few different sizes of these Rocket Airs, ultimately the difference is how much air you can blast onto the pesky little piece of dust. I have several different sizes and have found the Medium more than adequate for mirrorless cameras. The larger Rocket Airs are nice really for DSLR’s where you need to get deep into that mirrorbox. If you only have an X100F, the small size will be fine. This is by far my favorite camera to customize and I’m finding myself always mix and matching different accessories to give it a different look. While some accessories are better than others, some might work better for the look your going for. This is especially true for lens hoods and soft shutters. There is so much great stuff being made for the X100F and I’m finding it difficult to keep up, so if you find anything you can’t live without, let me know and I’ll try it out and add it to the list.